I mentioned in an earlier review that I was hoping to get a copy of The Northern Heartland Kitchen, a new seasonal, local cookbook from the University of Minnesota. Well, lo and behold, in the most recent batch of books I picked up from the Minnesota State Horticultural Society for review, was a copy of Beth Dooley’s cookbook. 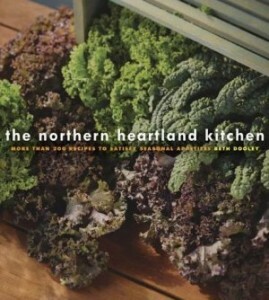 Dooley has been writing about food in Minnesota for many years, and if you read Mpls/St. Paul magazine, you are probably familiar with her restaurant reviews. In this book, Dooley marches through the seasons, creating recipes and meals with ingredients most likely to be local in markets in the North. So fall is filled with delicious ideas for using squash, apples, cranberries, duck and kale, while spring boasts recipes for lamb, arugula and asparagus. While the ingredients used are local, the recipes span the globe with Dooley offering an Asian-inspired Chicken Noodle Soup, Scandinavian Baked Beans and Spring Vegetable Curry as well as Midwest standards such as Corn Relish, Apple Crisp and Beer-Can Chicken. For the salad, combine: 7-8 organic carrots, grated (3.5 cups); a large bunch parsley, finely chopped; 1/3 cup dried cranberries. Mix the dressing: 1 large clove garlic, mashed, 2 TBSP raspberry (or other fruit) vinegar, 2-3 TBSP vegetable oil, 1/2 tsp salt, 1 TBSP smashed fennel seeds. Whisk dressing together, combine with carrot mixture. Cover the bowl and let the salad rest in the refrigerator for a few hours or overnight so the flavors blend.